The large whiteboards in the conference room/kitchen of the Springfield office of Rebuilding Together are mostly clear at the moment. The period from the holidays through the first few weeks of the new year are comparatively quiet at this agency — which touts itself as the “nation’s leading nonprofit working to preserve affordable homeownership and revitalize communities” — so there are only a handful of jobs, or projects, listed on the boards. But that will change soon, said Colleen Loveless, executive director of the Springfield office, which is ramping up for what she expects will be another huge year. And as the calendar inches closer to the last Saturday in April, or National Rebuilding Day, as it’s called, those boards will be filled from top to bottom with projects, sponsoring groups, volunteer units, and other pertinent information. 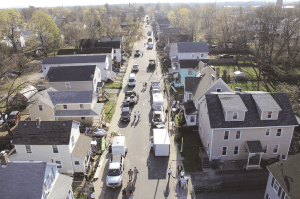 It was that way last year, when the agency marked the occasion with a tightly coordinated campaign, aided by an army of 1,000 volunteers and 70 sponsors and donors, that changed the face of Tyler Street in Springfield’s Old Hill neighborhood. This ‘cluster rebuild’ — also called a Green-N-Fit project because of its focus on ‘green’-related initiatives such as converting heating systems from oil to natural gas — featured efforts to renovate, repair, and refurbish 25 homes on that street, most all of which were close to a century old, tired, and energy-inefficient. The rebuild brought a new look to Tyler Street, but also new enthusiasm, new hope, and some unexpected consequences. The crowded whiteboards in the conference room have become one indicator of what Loveless has accomplished since she became the first executive director of this office more than four years ago and promptly began taking it to another, much higher level. But there are many others. The Rebuilding Together brand, not to mention its reach, have been taken to a new level under the leadership of Colleen Loveless. Most are to be found in the office’s front lobby. There hang collections of photographs chronicling last April’s cluster rebuild, as well as a recent project to rehab a transitional facility for 12 homeless veterans on Maple Court, and another to repair and refurbish 25 homes damaged by the June 2011 tornado that tore a path of destruction through the city. There’s also a shot of Loveless being presented with the Booze Allen Hamilton Management Excellence Award in 2012 as the top affiliate among the more than 200 chapters nationwide. Beyond the photos, though, there are numbers, and many of them, to quantify what Loveless has accomplished in her tenure. She has grown the affiliate from being the 149th largest of the agency’s chapters to the 18th largest, and from nine home projects and a $130,000 budget to a high of 71 rebuilds (in 2012) and a $612,000 budget. Using a formula of leveraging an additional $4 in monetary and in-kind donations for every dollar spent, that adds up to an annual investment of more than $3 million in Springfield’s housing stock, which has made the City of Homes more deserving of that historic moniker. But if current events and those of the recent past have prompted generous amounts of optimism, enthusiasm, and energy, one could make a strong case that the future looks even brighter. Indeed, Loveless and her staff are putting the finishing touches on an ambitious strategic plan for the organization. It has a long name — ‘Rebuilding Together: Green-N-Fit 10 in 10; Maximizing Cluster Builds to Benefit the Old Hill Neighborhood, the State Street Corridor, and the City of Springfield’ — but a broad, yet simple, objective. This endeavor will continue the work started last April for the next nine years, revitalizing contiguous blocks from Tyler Street to Hickory Street (see map, page A12) thus changing the look — and, in many ways, the fate — of what is statistically one of the poorest neighborhoods in the country. This map shows the battle plan for Green-N-Fit 10 in 10, which will change the face of several blocks within the Old Hill neighborhood. While building on the impressive set of numbers compiled in her first four years at the helm of the agency, Loveless has some other work to do in the months and weeks to come, especially in the realm of awareness and telling the nonprofit’s story. Indeed, there are many who are not aware of what Rebuilding Together does, how, or why, she noted, and there is also considerable confusion with regard to other agencies with like-sounding names — DevelopSpringfield and Rebuilding Springfield are just a few — and other nonprofits with housing-related missions, such as HAPHousing and Habitat for Humanity. And because of the effective manner in which she has articulated, communicated, broadened, and carried out that mission, Loveless is clearly worthy of the designation Difference Maker. 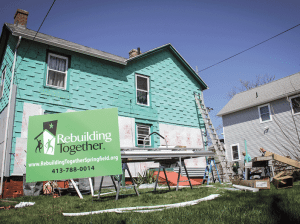 Photographs of the massive National Rebuilding Day effort last April certainly help tell the story of how this agency has evolved and grown over the past several years, and changed the landscape in Springfield — figuratively and quite literally — in the process. One aerial shot (see below) conveys the scope of the effort, the high level of coordination, and the large amounts of energy, camaraderie, and good will that were generated by convening so many volunteers and supporting businesses to bring new life to one small but significant corner of the city. “It was truly a community effort — many different groups and individuals were involved with making it all happen,” said Loveless, who spent much of the day choreographing the production, which was compared by many to a movie set because of the sheer volume of people, not to mention the drama that was unfolding, on site. It was a world — or several worlds, to be more accurate — apart from what the local affiliate of Rebuilding Together was doing back in the early ’90s, when the national agency was called Christmas in April. That’s because it only did projects on that one day each April, said Loveless, adding that the organization was launched locally by three banks — SIS (now TD Bank), Hampden Bank, and BayBank Valley — and had no paid staff, just a volunteer board that would work on perhaps a half-dozen houses a year, focusing on painting, landscaping, and other small projects. As the nonprofit expanded into a year-round initiative, a name change was obviously necessary, she went on, and Rebuilding Together, which accurately and succinctly sums things up, was chosen. 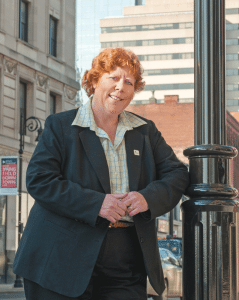 It was in 2009, she said, that the board decided that the Springfield affiliate needed to respond to consistently growing need within the community and expand its mission and scope. Demographics played a big part in that decision, she told BusinessWest, adding that the population of Springfield, as in all cities, was aging, and individuals were finding it more difficult to remain in their homes and keep them properly maintained. “Many of these people had lived in their homes for dozens of years, decades and decades,” she said. “Now, they’re on Social Security, and they want to stay in their home. So we would build them a handicap ramp or fix their leaking roof. “The board saw this growing demand and decided it was time to open an office, hire staff, and make it a year-round program to serve more people in need,” she went on, adding that the opportunity to manage that office appealed to her, professionally and otherwise. At the time, Loveless was operating her own category-management company, called Popmax (short for point-of-purchase maximization) International, which she launched 15 years earlier, while also venturing into commercial real estate with a small portfolio of rental properties. She also built her own home. Loveless first set up shop in the Scibelli Enterprise Center (now the Business Growth Center) in the Technology Park at Springfield Technical Community College, but quickly outgrew that space and moved into the Colonial Block on Main Street in Springfield, just a block or so from where the tornado tore through the South End on that fateful June day. Over the past few years, Loveless has expanded the agency in a number of ways, from the number of projects to the types of endeavors to the work done on the houses chosen as projects. She related the story of one individual who pressed the agency for a fence, something that would ordinarily fall outside its purview because it doesn’t meet those criteria listed above. Funding from the agency comes from a number of sources, said Loveless, listing national retailers such as Sears and Home Depot, which target funds for specific constituencies, as well as regional and national foundations, corporations such as MassMutual and Columbia Gas, and a number of area banks. Meanwhile, volunteers come from all corners of the community, she said, adding that individuals and groups have found the work rewarding because they can not only see where their money, time, and energy is going, but they meet the people they’re assisting and see how they’re making a difference. The budget for the local affiliate has swelled in recent years simply because the need has grown, and for reasons ranging from weather calamities to a still-lingering recession that has kept many out of work, to the simple graying of America, she said, adding quickly that, while the agency has broadened its reach, it can serve only a fraction of those who qualify and request assistance. Therefore, the agency works diligently to allocate its resources in ways that will maximize their impact and improve quality of life for those who are served. 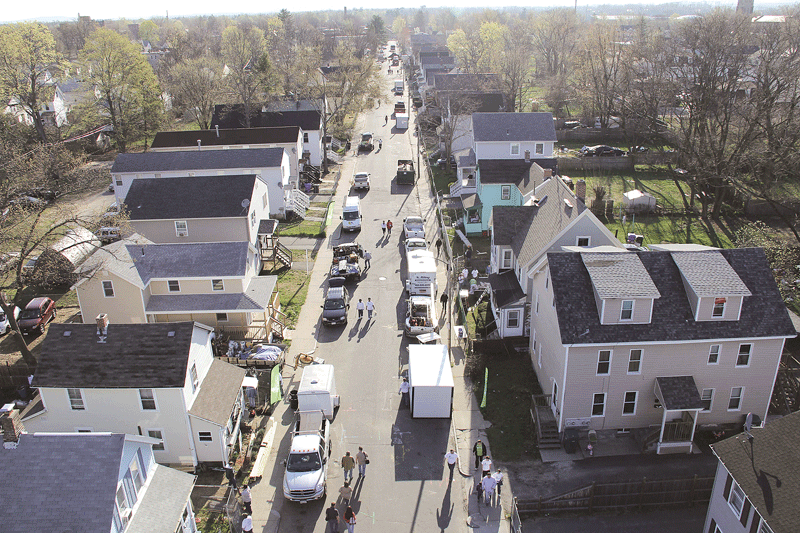 Many have compared the scene at last April’s cluster rebuild on Tyler Street to a movie set. Tornado victims comprise a constituency that clearly falls into that category, she said, adding that the agency responded to obvious need with a project that repaired and rehabbed 25 homes across the damaged sections of the city in five days. But there are other, usually smaller examples of how Rebuilding Together is putting resources to work in different and far-reaching ways, everything from work to renovate a playground at a Square One facility to that aforementioned project at the facility for homeless veterans. “We did extensive work inside and out — we invested $150,000 in that one house,” she explained, adding that the project was funded in part by a grant from Sears and its Heroes at Home program, which assists veterans. “We had volunteers from Westover and Barnes … there wasn’t a part of that house that we didn’t touch. We put in new floors, paint, a new roof, a new kitchen and baths, carpeting, curtains. At the end of the day, Bob’s Discount Furniture brought in all new furniture. And it is with the goal of maximizing resources that the agency focused all of its National Rebuilding Day efforts on one street last April, and also why the plan for the next decade is to continue focusing on the Old Hill neighborhood, even while there are many areas of the city that need assistance. 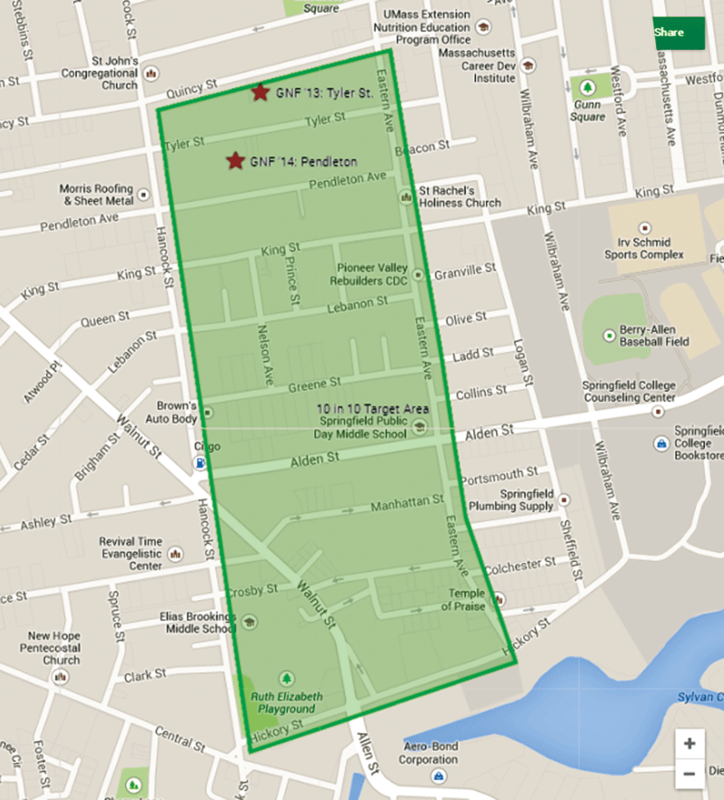 The next block will be Pendleton Street, she said, adding that she expects that the agency will be able to duplicate the intensity — and the results — recorded last year, in large part because of the momentum generated that day and the positive energy created by a collaborative effort that involved church groups, several businesses, the roughly 100 people involved with the Western New England College football team, and especially the people who live on Tyler Street. 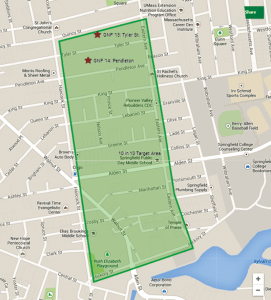 After Pendleton Street, moving southwest, Green-N-Fit 10 in 10 will focus its resources and energy on Pickett Place, King Street, Lebanon Place, Nelson Avenue, Prince Street, Merrick Avenue, Lebanon Street, Monson Avenue, Green Place, Greene Street, Alden Street, Manhattan Street, Searle Place, Marshall Street, Crosby Street, Walnut Street, Melrose Street, Hickory Street, and Eastern Avenue, said Loveless, conceding that, to those not from Springfield, those are merely words on a map. But to the families who live on those streets, it’s home, and it’s been their home for more than 20 years, on average. And they want it to be home for many years to come. Helping them accomplish that goal has been Rebuilding Together’s ongoing mission. It’s a broader, more impactful mission now, and because of that, this agency, and especially its first executive director, are truly Difference Makers.